If you want the ultimate beach vacation experience, then this condo is for you. The view and location is the best! Dorchester street is right at the main part of the boardwalk/pier. You come across the bridge into Ocean City and make a right like you are going to park at the large parking lot by the pier. 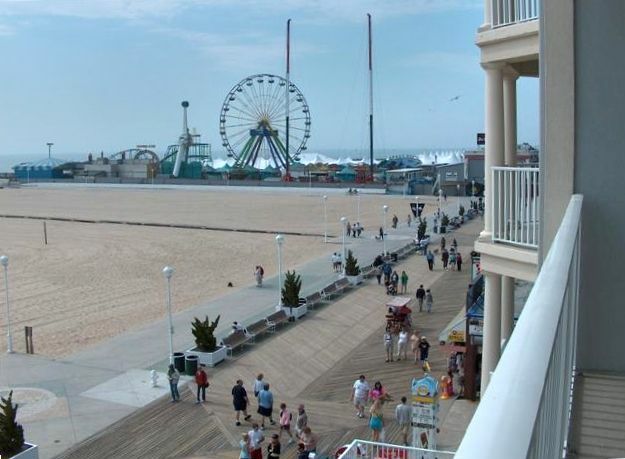 All the famous Ocean City attractions and shops/restaurants are within site. The unit is beautifully furnished and decorated. Originally, it was the model. It has everything that you will need to enjoy all the comforts of home. High Speed Internet, Washer/Dryer, Full furnished kitchen, Flat Screen TVs with Cable, Surround Sound, etc. This unit has it all. Just park your car in our garage and never have to worry about fighting the traffic and finding a parking space. You have two parking spaces and by the time you would have walked to get to your car, in this condo, you will already be at the main part of the boardwalk! The balcony overlooks the largest section of the beach. The view is awesome. The boardwalk is right below. Enjoy the stocked storage unit located on the same level as the parking spaces. In this storage unit, you will find boogie boards, beach chairs, a beach cart and more. This building was built and completed in the summer of 2007. The pool and big pool deck along with a putting green, fitness room and sauna is located on the same floor as the unit (4th). There are also security cameras, elevators and luggage carts. This building and condo simply has it all. It is simply beautiful and will be everything that you would desire in a top vacation spot in Ocean City! This lovely property is owned by three brothers and their families. The youngest brother is not pictured but as soon as we receive and updated picure, it will be displayed. Two brother live in Martinsburg, West Virginia and one lives in Purceville, Virginia. They all love Ocean City!!!! We purchased our Condo at the Belmont Towers simply because it was the best property in Ocean City (We looked at many properties before settling on Belmont). From the location to the views to the amenities to the new building, Belmont stands above the rest. Just look at the pictures or visit the building and you will see. Our condo is on the boardwalk, is ocean front, and is located at the end of the boardwalk by the inlet where all the action is (restaurants, rides, entertainment, shopping, etc.). The largest portion of the beach (sand) is also right in front of Belmont. This is the place in Ocean City!!! The views, the location, the food, the shopping, the entertainment, the amusements/rides, the quality of the beach/boardwalk, the once model/beautifully furnished and decorated condo, the high speed internet, digital cable tv and flat screens, surround sound system, comfort and amenities including a nice pool, putting green, fitness room with sauna, storage closet with access to beach items, a nice parking garage, and so much more. Large Pool Deck with putting green, Building/Facility (Built and opened 2007) - Right near the Pier/Amusements, large section of the beach. Thrashers, Candy Kitchen, Ripleys, and many more. No hassle with having to drive and find parking spaces - Each unit comes with 2 garage spaces, walk out of the building and onto the boardwalk or beach! Also has a great surround sound system with speakers in all bedrooms, living room, and balcony with flat screen TVs for Cable or logging on to Netflix. This was our third time staying here, and it’s always great. Amazing location, beautiful condo and very responsive and helpful host. OMG, the condo is amazing! I have stayed at a lot of different vacation homes, but this was probably the nicest one I have ever stayed at. The condo is beautiful, well stocked, comfortable beds, furniture and very clean. The view is to die for! We had a perfect girls extended weekend and would definitely consider staying here again. Thanks for answering my question about Netflix! The condo is neat clean and very spacious, all 3 bedroom/ bathroom combos are very functional and comfortable. The condo is located in the heart of the boardwalk and has great views of ocean and beach. We look forward to future stays at the Belmont Towers. The condo was well stocked and beautifully decorated. The beds were comfortable and the living room and bedroom furnishings were clean. The outside table and chairs were new. The view is breathtaking. I would recommend having a linen package available. We will be back!! This is a nice place to stay but someone forgot to have it cleaned before our arrival. Very disappointing and being charged for cleaning service. Not happy at all!!!!! Beautiful home, very clean, lots of room for all 10 people to hang together in the living / dining / kitchen space, and owners were very accommodating and responsive to contact. Coming back next year! Fitness Room, putting green, and sauna on-site. We rent Saturday to Saturday for Weekly, Seasonal rentals. Once full payment is received including the Refundable Security Deposit, within 10 days of your arrival an email will be sent w/wireless key codes w/further instructions that should answer all your questions regarding gaining access & using our condo. Remember, only full week rentals during summer months of June-Mid-September.